The most advanced QA tool for pixel-perfect results. 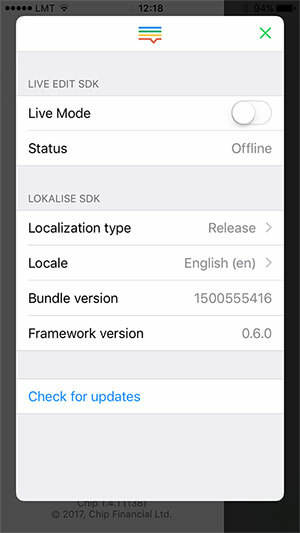 Lokalise iOS SDK Live Edit Module is the brand-new extension of Lokalise iOS SDK. The Module shows the constantly updated mobile screen in your Lokalise editor. The screen mirrors the linked device with installed prerelease version of your app. First, it provides an editor or a QA / LQA specialist with the live full context of the translated string. Second, it ensures the pixel-perfect visual experience, showing the edited strings in proper font, proper place, just as the end users will see it. How it works? See 1 minute video. Want to try how it works? We've built a Lokalise Companion app that would create a demo project for you and let you play with the Live Edit Module. Some of the system interface objects, e.g. search bar, might not get translated when changing the application language at runtime. Dependencies will be installed automatically. If you would like to install manually, download LokaliseLiveEdit.framework and add it to your project. You will also need to install the Lokalise SDK. // Without this call LokaliseLiveEdit uses isolated Lokalise framework instance. You can find more details on Lokalise SDK here. Note, SDK tokens need to be generated under project settings > General tab. // This will enable the shake gesture support. Debug menu will appear once you shake your device. // If another library in your app is using the shake gesture you can present the debug menu manually instead. Since version 0.1.5 Live Edit Module automatically extracts keys associated with translations in your current View Controller. Exact matches, concatenated translations, and translations with placeholders are supported. If the keys you expect to appear are still not detected by Live Edit Module, implement the LokaliseKeysProvider protocol on your View Controllers. Use localizableKeys() method to provide this controller with available keys. Additional setup is required if your custom UI elements do not use UILabel, UIButton, UITextView, UITextfield or you are using a 3rd party UI library that doesn't. To do that you need to implement the LokaliseStringExtractable protocol. The extractString method should provide text that is currently displayed. Here you can find a ready-to-use extension for AsyncDisplayKit (we will be adding more to this list). If you are using a library that doesn't work out-of-the-box with Lokalise Live Edit contact our support, we will look into and try to add it our list. Once the translation is updated in the Lokalise editor, our framework posts the LokaliseDidUpdateLocalizationnotification. You should subscribe to it, then call your update UI method which will re-render the UI of the view controller. 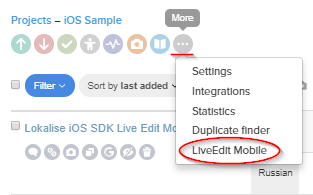 Open the Live Edit Module page in the Lokalise editor by clicking the Live Edit Mobile button in the toolbar under the more options dropdown. Shake your phone to open the Live Edit Module menu. In case other libraries in your app are using the shake gesture, you need to override the default setting and open the debug menu manually). 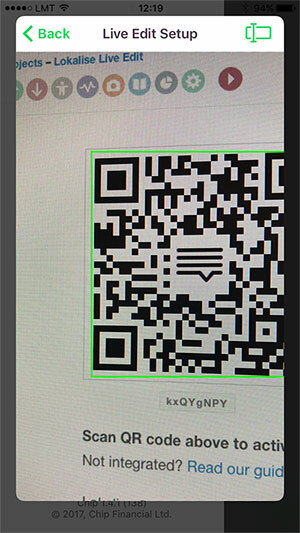 Flip the Live Mode switch to scan the QR code. On the device you will be prompted to scan the session QR code . You also have an option to enter it manually (if you use a simulator it is the only option). The Live Mode is turned off by simply flipping the Live Mode switch. Consult Lokalise SDK Troubleshooting section.